For a reliable ant exterminator in Las Vegas, choose Flatliners Pest Control. We are the expert when it comes to removing, eliminating, and preventing ants at your home or property. Ant infestations can be extremely troublesome, and they just never seem to go away. So if you’re ready to solve your pest problem for good, give us a call and let our reliable ant exterminators do the job right. 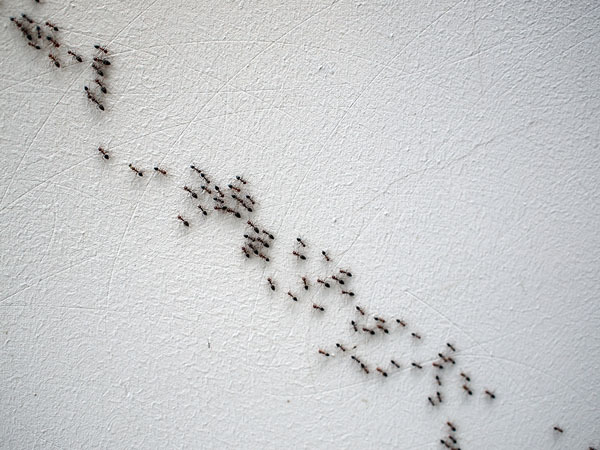 Have you ever walked into your kitchen to find a steady stream of ants hauling off your sugar or other crumbs? It can be an amazing science project to study these eusocial creatures, but not all over your countertops and your home. Ants are incredibly resourceful and durable insects. They can lift 20 times their weight, so large crumbs are no issue for them. As they crawl through your house looking for food, they leave a scent for the others to follow, forming an ant trail which leads back to the queen. Taking out the queen is the key to eliminating the rest of the colony. That’s where we come in. Our process flushes out the queen quickly and gets rid of the rest of the ants efficiently in all areas of the home. Where Do These Ants Come From? Two of the most common ant species found in Las Vegas are Argentine Ants and Pharaoh Ants. The Argentine variety are about 1/8″ long, and their colonies grow very rapidly and often combine with other colonies to dominate the area and your property. They can be very aggressive, which can make them hard to manage by yourself. Pharaoh Ants are smaller at only about 1/16″ long but become an immense problem when they move into your home by the thousands. They like moisture and will travel long distances to gather their food. The Pharaoh ant colony will often split apart when generic and removal tactics are attempted, which is why it’s important to call the team at Flatliners Pest Control as soon as you see them. At Flatliners Pest Control, we take pride in offering effective ant extermination and prevention solutions that are safe for your family and provide results. Our experienced ant removal technicians only use products that are safe for children, pets, and the environment. They won’t kill plants, trees, or grass, and we also have a completely organic option. This is just one of the things that set us apart from other pest control companies. We get rid of these unwanted pests with a safe and reliable removal process that works. If you need an ant exterminator, Flatliners Pest Control serves Las Vegas, Summerlin, Henderson, and the greater Las Vegas Valley. Our ant removal experts exterminate the queen and eliminate the colony. We can advise and provide you with prevention solutions, so they never come back. Safe for the environment and your home, our products are the best in the business. Give us a call today, and leave it to the experts in ant removal.